The Vines We Planted by Joanell Serra tells the story of a family facing struggles and their individual crisis. Uriel facing a rejected love and a wariness to re-commit; Amanda searching for acceptance and her place in the family; Gloria doing all she can to raise her son, facing immigration problems and a hopeless ex; Elena, married to Jim, as her marriage crumbles. 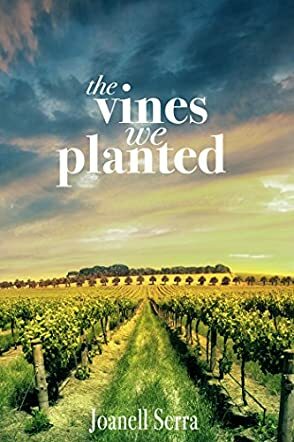 All of these issues are delicately and expertly woven together in a family saga set in California around Uriel’s family vineyards, where each relationship appears to have a bearing on others, and the struggles of one become the struggles of them all. The author, Joanell Serra, has crafted a really great novel. The reader is kept turning the pages to the end as the intricate family history is revealed through the plot. Great characters, well developed and believable, and lovely descriptions which transport the reader to the Californian countryside. The writing has a consistent pace and each chapter has a good ending that entices the reader and makes the reader reluctant to put the book down. Very visual writing and descriptions take the reader into the protagonists’ world. There is nothing to dislike in this story; the plot is credible and surprising at the same time, and yet it all blends together well and combines to make an exciting and believable novel. The characters are so good that they could easily continue in a sequel. Well done to author Joanell Serra on her debut novel that is sure to be well-received.